I have this weird thing for under-$100 items. I hoard them in my shopping carts across multiple retailers so that when someone asks me to recommend an item for any occasion, I have a suggestion that is not only on trend but on budget, too. It’s why I started this franchise (see previous iterations here and here). Today, I decided to focus on items that hit on key fall trends. After all, if you can update your look for fall without spending a ton, you have more money to spend on timeless fashion pieces. 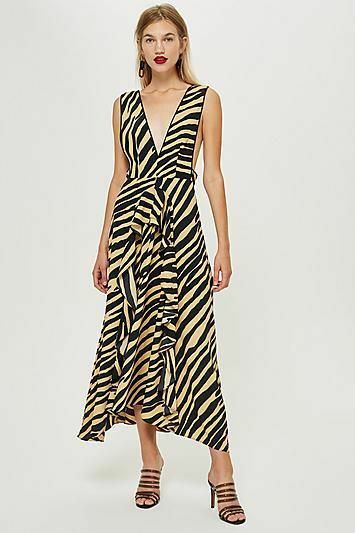 Ahead, my top under-$100 picks that hit on the biggest sartorial moments of the season, from the animal print that’s taken over the fashion world to the bold color that we haven’t seen since the ’80s. This Topshop dress style is famous. That paper-bag waist is just waiting for a belt. She’s having fun, and so will you in this easy, floaty frock. Take a cue from the model and wear it layered with a tee. Available in S to L.
Every day, at least one person on the editorial team is wearing this skirt. This is Tiny Purse Fan Club–approved. If you get a close-up, the seaming on this top looks quite expensive. Our love for bodysuits knows no bounds. You don’t often find MSGM at prices like this. In case you want to look like an Ibiza yacht club regular. It also comes in neon orange. For the neon-shy, this is the way to style it. The belt bag just got luxe. It also comes in baby blue. We never knew we loved red croc—until now. Emerald is a lovely color for faux croc. Your grandmother’s best purse… except not. This is just straight-up cool. This fit is oh so flattering. We're fairly certain at this point that the '90s trend is here to stay. For the ultra-adventurous, mix your plaids for a bold effect. Wear this with bike shorts while it's still warm out. Not over spots and dots yet. A big heck yes to these earrings. A rhinestone belt is more versatile than you think. If a razzle-dazzle belt isn't your speed, we picked out this daytime one too. May we interest you in a sparkle sock? This skirt walks the line perfectly between '80s and 2018. Hold up. This bag is stunning. Our UK team wrote about how this bag is suddenly everywhere, and we can see why. Olive is just as easy to wear as black, we swear. This is the most millennial thing we've ever seen, and we love it. Mini canvas totes are so much better than regular-size canvas totes. We know these aren't under $100, but can you blame us for including them? If only the pants were just as affordable. We're getting Paco Rabanne vibes. You knew there was going to be a slick trench in this roundup. Iridescent without being overly sweet. To go under your trench, of course. No one does smart tailoring at this price point like Zara. Sensible kitten heels with a healthy helping of style. Your collared button-down just got jealous. Don't miss the track stripe down the sides. Into my giant under-$100 roundups? Check out this one I did a few weeks back.